This silhouette was taken at the groyne in Hopetoun yesterday. 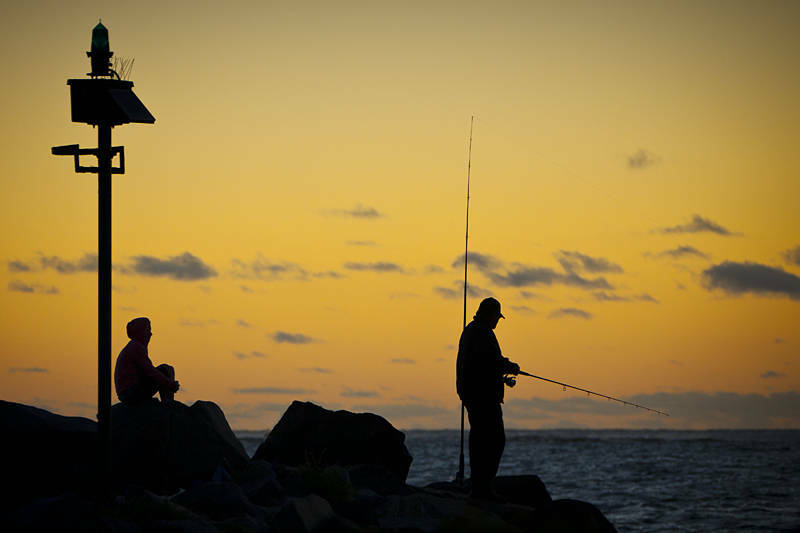 Fishing is a popular sport in Australia and there are usually around a dozen people fishing at sunset in Hopetoun each night. The time here has flown by and its hard to believe we are half way through our six weeks work here. We have both really enjoyed working at The Deck and will miss it when we go. I’ve been updating The Decks Website this year and have just put the new site online. I have a few more bits to add but most of it is there. Let me know what you think. You might want to check what it looks like on a mobile browser or two. With the fixed page width if I shrink the browser the text doesn’t neatly re-flow around the picture. Other than that it’s looking good, certainly an improvement on the old site. Your email link does not work on the Deck Page. It modified my comment! I will email you the correct text. Thanks for the html. Sorry blog software cuts some of it. I can see what you wrote originally via admin view. I will try to shrink the text and add the accent when I get back to work on Saturday. Email link seems to work fine on the Deck page. What happens when you click on it? Nothing happens when you click on it. It needs the “email:” in the HTML code beforehand which causes it to bring up the viewer’s email client. “mailto:” in the html brings up viewers email client on all the machines I’ve tested it on. Does the contact link at the bottom of this page work on your machine? Sorry – it must be me as it is not working on other sites with email links. Something must have changed on my machine. Apologies! It works OK in IE – must be Firefox ! We have not been very impressed with the latest Firefox. It seems to have a few issues. According to rfc1738 “mailto:” is the correct resource locator for an email address. However it’s getting more common for plugins to hook into mailto: usually for the purposes of opening webmail rather than launching an external client. Benz, I trust you are also trying the pages in Google Chrome? The devtools are really quite nice for showing page loading times and the like.